When decorating a home for the holidays, or really for any day, the obvious method that comes to mind is to pick out what looks appealing. Decor is something we all look at, but to create a truly inviting home, consider decor that awakens each of the five senses. When you walk into your holiday home, imagine being taken away by the sight, sound, feel, scent and taste of yuletide joy. Stun your guests and take your holiday decorating to a whole new level this season by creating an engaging experience that engages all five senses! 1. Do You See What I See? The tried and true method of decorating is to utilize sight in picking the right pieces to accent your home, working towards an overall theme that appeals to you. Whether you decide to venture down a vintage path, recreate the North Pole or adorn your home with cold-weather creatures, the options are endless with our festive holiday decor. Max, Dakota, Bailey and Alexis are adorable 2-Ft. 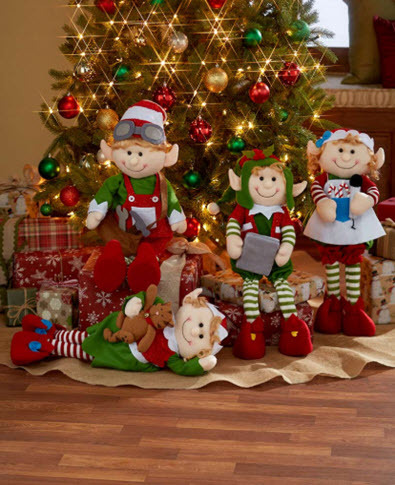 Decorative Holiday Elves that would be a delightful addition to your holiday decor. 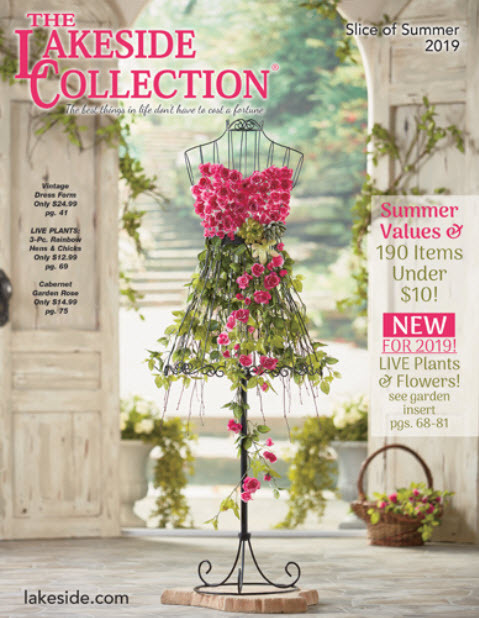 Their faces are as cute as can be, their outfits are festive and they can easily be incorporated into your home design. The more elves you buy, the more scenes you can set! These characters can sit on a present looking adorable, or be propped by a window peeking outside. They can be posed under the tree, or sit front-and-center on a bed. Our exclusive elves will be a sight to see, however you choose to display them. Music can be an instant reminder of fond holiday memories. Whether reminiscing of decorating a childhood Christmas Tree, singing Christmas carols with friends or sipping egg nog with family, sound is a gateway into the years past. Decor with sound can fill the empty spaces in any room while adding the perfect finishing touch. 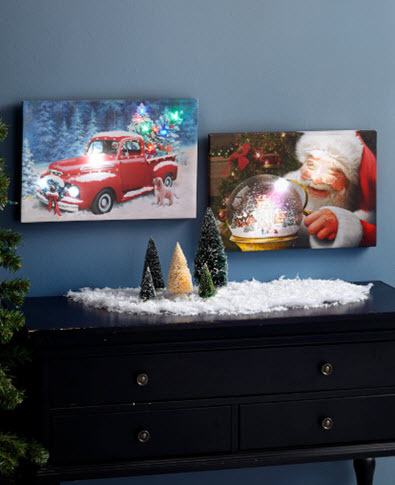 The sound comes from an unexpected place when you decorate with Light and Sound Christmas Canvas Wall Art. As a guest walks by, the art is motion activated to play a familiar holiday song with lit accents. You won’t need to put on a Christmas song to set the mood with this artwork, it does that job for you. Place it in the entryway to welcome all who enter your home, or hang it in an active room so that the tune plays throughout the day. There is nothing better than a warm and cozy Christmas. Some decorations, such as our Faux Fur-Trimmed Plaid Pillows or Stockings, can bring feel-good warmth into your room before anyone has even touched them. Upon entering a room decorated with accents of faux fur, sherpa or fluffy pillows, one can’t help but think of snuggling up with a novel and mug of hot cocoa. Once a guest has sat down next to the fuzzy pillow or runs their hand along the super-soft stocking, they will feel like they fell into ultimate comfort. Even pets will love that these items are faux fur! Christmas can be a candy land with the sweet treats and warm eats that are at the center of the holiday. Fudge, candy canes, figgy pudding, and rum cake are just a few of the classic treats you can expect at Christmas. While a plate for Santa’s cookies is a decor must and a gingerbread house is tried and true, keeping other treats in mind while decorating will have your guests’ taste buds dancing. With our 20-Ct. Gourmet Lollipops in Holiday Box there is sure to be a flavor that every guest will love. You’ll get a variety of flavors including cherry cheesecake, bubblegum, orange dreamsicle and other fun flavors. 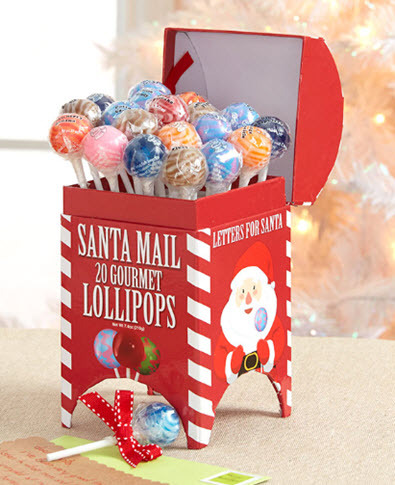 Lollipops arrive in a charming mail box that can hold letters for Santa after the lollipops are gone. We suggest buying an extra so you can adorn all of the presents under the tree with their own lollipop treat tied to the tag. The more places you hide a decadent treat, the more ways you can awaken the senses. Another sense that can truly fill a room is that of pleasing scent. As soon as a guest walks past the threshold, a fresh, familiar scent can usher them headfirst into the holidays. When you walk into a restaurant, it’s the smell of spices or sweets that immediately tell you if you will enjoy the meal. Decorate with this same thought in mind. The holidays have a lot of staple scents to set the mood instantly. A true winner is an item that combines several senses. Not only do the 18-Oz. 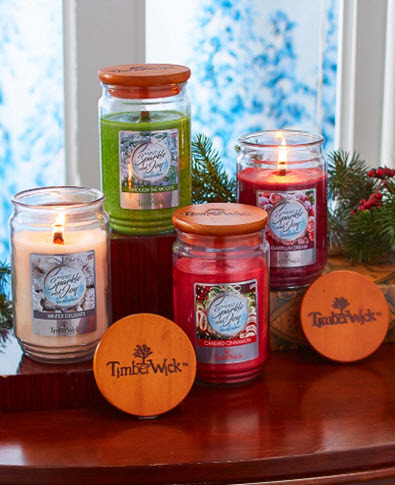 Timberwick Holiday Jar Candles send a pleasant scent wafting into the room, they make a subtle crackling sound like a tiny fireplace in a jar. There is a scent that will appeal to everyone: Through the Woods is for those who love the piney outdoors, Sugarplum is a sweet scent that will have you dancing in your dreams, Winter Delights brings thoughts of baking cookies and Candied Cinnamon is a traditional reminder of sweet and spice. Now that we’ve touched on all five of the senses and how to incorporate them into your decor, you will be able to wow your guests as they see, hear, feel, taste and smell their way into the holiday spirit, all thanks to your decorating know-how. Wander through the Lakeside site and see what other decor you can find. You’ll have fun categorizing them into the senses that they will awaken. While some senses shouldn’t be overwhelming, like scent, others can be maximized by incorporating several sense-awaking items. Beauty abounds in everything that is visually appealing, and why not have a different tasty treat in each room? Keep your mind open and your senses on high alert, the rest will fall into place.